store openings throughout the US. Santeramo in Colle (Bari), March 7, 2017 – Natuzzi, Italy’s largest furniture house, opens its doors in The Design Center located off Route 17 North in Paramus New Jersey, the first Natuzzi U.S. store to open in 2017. The 9000 square foot selling space showcases the evolution of the Natuzzi brand experience. The new location and format features the entire Natuzzi Italia range of furniture and accessories including the newly launched motion sofas and dining tables Two new product standouts in the collection are the uniquely comfortable Ilia chair, designed by Mauro Lipparini and the light and linear Leggero dining table, designed by millennial architect, Victor Vasilev. 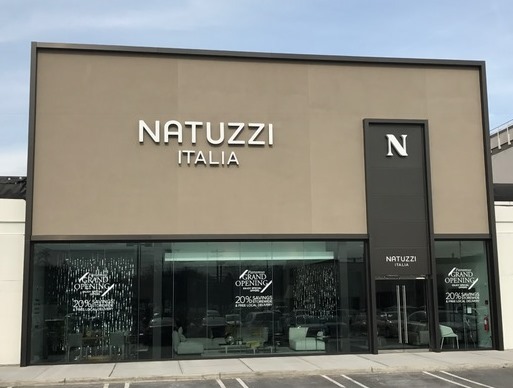 In addition, Paramus will be the first location in the US to display the new merchandising strategy of Natuzzi Italia including a millennial inspired line of stylish and affordable products. Some examples of this collection include the Urban, a classic motion sofa selling for just over $2500., and Lira, the dual motion mid-century modern recliners with a starting price point under $2,500. The classic yet contemporary Agra chair will retail at about $1,000. “Retail expansion in the US is definitely a key pillar of our plan, both through our direct-owned stores and our regional partners. To sustain our strategy in the US we have built a new retail organization across all business drivers and across all states. “ said Chief Officer Nazzario Pozzi. The new stores, designed by the Natuzzi Style Center in Italy, reflect the evolution of the brand experience which brings to life the true spirit and DNA of the Puglia based brand known to create quality spaces where the only rule is harmony. Pasquale Natuzzi, Chairman and CEO of Natuzzi SpA, said: “Thanks to the investments made in recent years, Natuzzi has become the best known brand among the world’s luxury goods consumers who buy design and furnishing products. Now, we must capitalize our brand awareness by increasing our retail expansion. Our goal is to build a closer relationship with the customer, continuing to offer unparalleled quality and a unique shopping experience through our stores”. The company will continue with the rationalization of its retail network to maintain a balanced portfolio of the right stores in the right places.